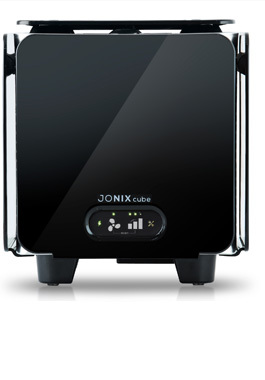 Thanks to its innovative technology, Jonix Cube represents an ionizing, source; it does not need additional filtering, making maintenance costs extremely low. 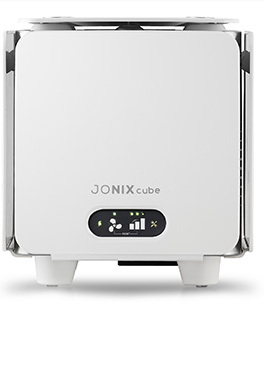 Jonix CUBE is an air purification device; it is a design equipment that uses an advanced technology called cold plasma to eliminate bacteria, mould, viruses, pollutants and odours. Air pollution directly affects the body's vital functions and our ability to stay healthy. CUBE creates the ideal conditions for the body, guaranteeing better general health: it provides relief in case of breathing difficulties in asthmatic and allergic people, optimizing their respiratory functions; it improves the vital functions and increases the absorption of oxygen by the body. CUBE protects against airborne microbial contaminations in any area where there are a lot of people and in crowded rooms. Jonix CUBE is available in two basic colours: black and white. Thanks to an easy assembly system of the outer faces, is possible to customise your CUBE using different materials and graphic effects, thus transforming it into an extremely versatile device, which can be easily integrated into any room. Particular attention was paid to creating a packaging that is sustainable and, above all, reusable. The wood-pack version is hand-crafted in natural fir wood; the casing of Jonix CUBE has a simple and elegant design, which is at the same time functional and can be repurposed as a container. Alternatively, there is the recyclable cardboard packaging. Jonix Cube uses an advanced oxidation process for the decontamination of air induced by non-thermal plasma, also called cold plasma. Cold plasma is a physical phenomenon generated at room temperature. Plasma is an ionized gas consisting of various electrically charged particles: ions, atoms and molecules of organic and chemical origin that collide with each other producing oxidizing species. This is currently considered the safest and most effective way to decompose pollutants.
. Jonix CUBE is a device that sanitises the air in the room in which it is located, eliminating bacteria, mould and viruses present in crowded but also domestic environments. For this reason, CUBE can be used in different sectors, creating the ideal conditions for the wellbeing of the people.